I don’t want to make a habit of posting prank videos on the Vicious blog, but this is kinda funny and as long a video as it needs to be. Some people are stupid. 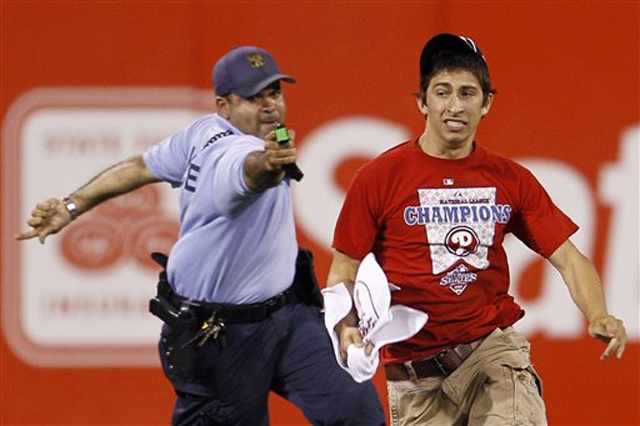 A 17-year old teen ran onto the field of Citizen’s Bank Park, home of the Phillies, and was shot with a Taser, ending the chase. People are questioning whether it was right to do so, but whatever. What’s done is done. I don’t see what the hubbub is. You’re not supposed to be on the field. If you get Tasered, you deserve it. I’ve never had the urge to jump onto a baseball field, but I’ve got to be honest. When I went to Giants’ Stadium last year, it was such a beautiful sight that i could understand WHY a person would want to do so. However, you still deserve what you get. Video is below. Pretty funny. Hilarious video explaining what makes Nike Air so special. Check out how he shakes the hand of a Haitian and wipes it off on Clinton’s shirt.